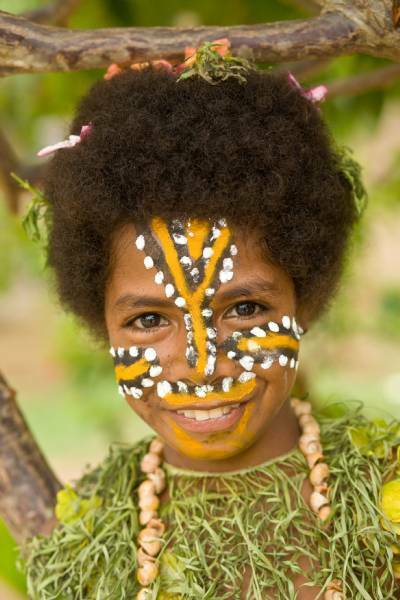 Dr Andy's latest article on our PNG experiences. One of the best things about boats, is that they take us to the places with no roads, to the wild places, where the rhythms of the tide and the weather and the seasons determine the pace of life. By my calculations I have spent more time driving boats than driving cars over the last few years, which is a very agreeable statistic for a marine biologist. In our modern world, I believe it is necessary to reconnect with such places on a regular basis, to recharge, to reflect, to be exhilarated, and to remember that the spirit of exploration is within us all. It doesn’t get wilder and more exhilarating than the islands of eastern Papua New Guinea that ring the Solomon Sea. This is True North’s spring playground on our Adventures in Paradise cruises which are now just a few months away. Our recipe as developed over the last 7 years is simple – take the best adventure cruise vessel in the Indo-Pacific; add 5-star luxury, impeccable crew service, and fine dining; blend with a good dose of Aussie humour, garnish with a $2million helicopter, and finally serve over a panorama of jungle-clad volcanoes, turquoise reefs, and white sand beaches! Bon appetit!! The 7 night Adventure in Paradise cruise is our longest running expedition in PNG. Like our Kimberley voyages, the itinerary has been fine-tuned to deliver outstanding and diverse experiences every day as we travel some 1,300km from Milne Bay to Kavieng, just 2 degrees south of the equator. Our day at Fergusson Island in the D’Entrecasteaux group is a prime example; at dawn we are in the jungle in Sebatuia Bay, watching the dancing display of the Goldie Bird of Paradise. By mid-morning we are fishing, diving and snorkelling over the fantastic reefs of the Sanaroa channel, with the helicopter whisking guests away for a 30 minute scenic flight around the towering peaks of Mt Vineuo on Goodenough Island, 2500m above sea level. A gourmet lunch is served as we cruise past the extinct volcano on Dobu Island and into Gomwa Bay. During the afternoon we snorkel the coast of Normanby Island or venture ashore at Dei-Dei Village to see the famous hot springs where lunches of a different kind were broiled during the cannibal era! Guests gather for cocktails on the bow at sunset as we cruise off toward Tufi and another day of adventure. My greatest passion is of course the underwater world, and the reefs of PNG are enough to get any marine biologist’s pulse racing! The coral communities here are extremely diverse, with hundreds of species of corals and fishes packed into each small section of the reef. The waters are warm, clear and calm, presenting perfect conditions for snorkelling and observing marine life, from the fine detail of a giant clam mantle, to the brilliant hues of the angelfish, and the majestic grace of the giant maori wrasses and manta rays. I take great satisfaction from guiding our guests over these amazing marine ecosystems. Regardless of whether you have snorkelled once or one hundred times, I guarantee you will see and learn something new while swimming with me over the reefs of PNG! The only vehicle more capable than a boat for accessing the wild places is of course a helicopter, and our Pilots Rob and Rainor have done a fantastic job in assembling a suite of flights over PNG that truly show off the rugged grandeur of this spectacular country. They will take you deep into the gorges of New Britain to view inaccessible waterfalls hundreds of meters high, and circle the active summit of the Vulcan volcano at Rabaul. One of our most memorable flights is the heli-trip from Tufi up along the coastline to the Kokoda track, landing at the Isurava memorial at the base of the Owen Stanley Range. The ANZAC legend for jungle warfare was cemented here through the brave actions of our boys some 70 years ago. Everyone returns from this flight deeply moved. The helicopter provides a truly unique perspective on this region and one that complements our marine and terrestrial activities. To celebrate our 25th year, our next 25 new Adventures in Paradise 2012 cruise bookings will receive a $1000 helicopter flight credit, a great incentive to enjoy the view from the heli! The hospitality and friendly smiles of the saltwater people of eastern PNG brings a wonderful human dimension to our PNG cruises. Our relationship with the local villages has been developed over the past 7 years and we are treated as returning family each time the True North arrives. This area was settled by sea-going Melanesians over 5,000 years ago. There is an amazing diversity in cultures at the remote islands we visit, with a subsistence lifestyle based on gardening and fishing. Dugout canoes are the common mode of transport, and thatch huts still par for the course. We see wild traditional dances (sing-sings) at several locations. There are plenty of opportunities to stroll through the villages and chat to the locals about their day-to-day life, purchase carvings and other fascinating artefacts. The beautiful smiles of the children and their clear singing voices are a memory that will last forever. Our PNG cruises depart directly from Cairns via chartered jet. We land in either Alotau or Kavieng and move directly from the airport to the True North with minimum of fuss. Lines are cast off as soon as the last guest is on board, and then it is non-stop luxury and excitement for the rest of the week. I look forward to welcoming you onboard True North and joining your fun-filled Adventure in Paradise in the very near future. I’m confident we can surpass even your highest expectations!